Log in to your ADT Interactive account through the customer web portal. Access the Customer Web Portal using a web browser on your PC, phone or tablet with an active internet connection. Click the link below to be re-directed to the ADT Interactive Customer Web Portal. You will be directed to the Home Screen. From this page the user is able to configure and control all aspects of the account. The Main Menu is used to navigate through the ADT Interactive features. Create Authorised Users to give access to your home/property. After you have created new users, assign them to receive Notifications. Refer to Users and Notifications FAQs on the Self Help Desk to learn more about setting up User Codes and Notifications. View video footage and configure settings for videos and devices. Live Video – View live video feed from installed cameras. Saved Video Clips – View previously saved video clips. Recording Schedules – Set up triggers to start recording. Settings – Configure settings for videos and Devices. Devices – View overview of home automation and energy management devices. Lights – Control light switches remotely. Thermostats – Configure thermostat settings. Rules – Manage Event-Triggered Rules. Set up and manage Push Notifications. Refer to the Notifications FAQ to learn how to set up Push Notifications. Manage Alarm System Usercodes and ADT Interactive logins for the Customer Web Portal and ADT Interactive app. Users – Authorised Users can be assigned a number to disarm/give access to a home or property. Manage Logins – ADT Interactive can have multiple users that access your mobile and web account. Login Information – manage login preferences like language, password and two factor authentication. Account Management – Change details of the property where the alarm system is installed. Devices – Manage settings of devices connected to ADT Interactive. Dealer Settings – Allows dealers or central station operators to access your system to perform actions on your behalf, view video and images, confirm system alarms, or monitor activity. Geo-Services – Notifications can be triggered based on your phone’s location. The Geo-Services page is where geo-triggered rules can be set up which activate these notifications. Check Current Alerts and Issues. Alarms and Issues will be displayed at the top of the home page. Displays the current status of the sensor. OK – No found issues. Open – Only applies to Doors/Windows. Will display open if Door/Window sensor is currently open. Activated – Only applies to motion sensors. Will display Activated if motion has been detected within the last 60 minutes. Idle – Only applies to motion sensors. Will display Idle if no motion has been detected within the last 60 minutes. 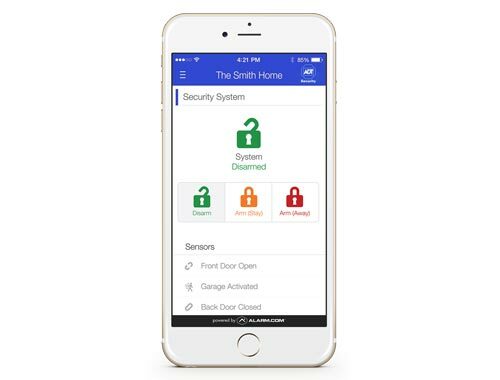 Bypassed – Any sensor bypassed is not “active” and will not trigger an alarm even if armed. Any Door/Window that was open during arming will be bypassed. User can directly bypass a sensor via control panel after it has been armed. To unbypass, close the sensor and re-arm the system. Low Battery – Sensor is reporting a low battery. Tampering/Malfunction – Sensor has lost contact with the panel or the sensor has been tampered with. N/A– Sensor state is unknown. If persists for more than a few hours, arrange service. View the Sensor Page Summary FAQ on the Self Help Desk for more information. Displays whether the system is currently armed or disarmed. You are able to remotely arm or disarm the system by clicking the shield icon. Details recent events reported by the system. You are able to drag and drop the cards to customise the layout. Hover mouse over the selected card and click the Move Icon  to re-arrange cards. Launch the ADT Interactive Phone App. If you currently do not have the app downloaded on your smartphone, click the Download link below. Use the Check Boxes  to add or remove cards from Home Screen. Use the Drag Handle  to shuffle the order of cards from top to bottom. Sensor Devices Page allows you to view the name, status and type of each sensor on the system. Describes the sensor and it’s location. This name will be displayed on the Website and Notifications. Indicates the type of sensor e.g. Motion, Reed or Panic Button. f enabled, you are able to see which doors or windows are opened and closed and when sensors have detected activity even when not armed. Click the checkbox of the sensor  under Activity Monitoring to enable. All sensors have Active Monitoring enabled. Select Home from the menu. Click the Shield Icon on the Security Widget Card which displays current panel status. Click STAY to arm the system to stay mode, or AWAY to arm the system to away mode. Note: Systems with bypass capabilities will show a Bypass Sensors checkbox that, when checked, will not arm secured sensors. Scroll down and click Export to Excel at the bottom of the page. This feature is only available on the Customer Web Portal. You are unable to export alarm activity as an excel document on the ADT Interactive app. Use the Search bar to view activity matching specific keywords. Use the All Devices dropdown menu to view activity from specific devices. The All Events dropdown menu filters activity by specific events. Use the Calendar Icon to view activity by specific times. Click the History Icon located on the top right corner. Select Filters to filter by time or event type. A Geo-Device must be setup in order to enable Geo-Services. Geo-Devices are any devices which have Geo-Services activated. They will appear on the Geo-Device List. Enable Location on your mobile phone. Apple Devices – Settings > Privacy > Location Services Android Devices – Settings > Connections > LocationNote: This may differ depending on the software version installed on your phone. Flip Toggle Switch  to turn Geo-Services on. Geo-Features and Geo-Fences can be set up once Geo-Services are enabled. Geo-Devices cannot be added on the Customer Web Portal. Add a Geo-Device by enabling Geo-Services on the mobile device. A Geo-Fence is an established perimeter which will trigger location based alerts based on the location of your Geo-Devices. You are able to Add, Edit and Delete Geo-Fences. The area around the installation address of the alarm system is the Default Geo-Fence. From the Geo-Services Page, you can Add, Edit or Delete Geo-Fences. Add Geo-Fence Location: Click and Drag the Drop-down Pin  on the map or enter a new address in the Move fence location to: field. Enter Geo-Fence Name: Enter the name of the Geo-Fence in Fence Name: field. Set Fence Radius: Click and Drag boundary markers OR manually enter a value in the Radius field. Click the Fence Name or the Drop-down Pin of the Fence to edit. Change Geo-Fence Location: Click and Drag the Drop-down Pin on the map or enter a new address in the Move fence location to: field. Change Geo-Fence Name: Change the name of the Geo-Fence in Fence Name: field. Edit Fence Radius: Click and Drag boundary markers OR manually enter a value in the Radius field. Click the Fence Name or the Drop-down Pin of the Fence. You are unable to add, edit or delete Geo-Fences on the ADT Interactive app. You are unable to access Login Information on the ADT Interactive app. Language Preference – Select the new user’s language preference using the Language Preference dropdown menu. You are unable to access Users on the ADT Interactive app. Two-Factor Authentication provides an additional layer of security to your account by requiring user confirmation when the account is accessed from a new device. Select Forgot Username or Password? Your E-mail address if you have forgotten your Username. Your Username if you have forgotten your Password. Select Login Help? from the Login Screen. Your Username if you need assistance logging in for the first time. Click +New Notification. You will be directed to the Notification Catalogue. Select the Standard tab and Click Alarm.  Ensure toggle switch is on to turn on the Notification. Notifications will be sent for PIR Master Bedroom and PIR Kitchen.Note: Do not choose to send a Duress Panic SMS or Push Notification to a potential Duress Code User. Click the +Add Recipient button to choose notification recipients. Click the entries in the address book that are to be notified or select +New button to add a new address book contact. Click Close and then Save.  Flip the toggle switch to enable Push Notifications. Select Sensor Activity under the Standard Tab. Configure the time frame for the rule to be active. Notification Filtering: Do not send notifications that occur within (Select Time Frame) minutes of the last notification.Check this box to limit number of notifications sent within selected timeframe. Do not send notifications when any of the following Geo-Devices (Select Geo-Devices) are inside the selected Geo-Fence (Select Geo-Fence).Check this box to not receive notifications while there is a Geo-Device inside an established Geo-Fence. Scroll down and select Sensor Activity. Enter the operating hours for your business in order to receive Fail to Close Notifications. A Notification will be sent to your mobile device or email address if an arming event has not been received by the set schedule time. Note: You can select additional events to receive notifications for other than the system not being closed on time. If you need further assistance setting up other schedule notifications, visit the Support Centre and submit a Support Ticket. Click +Add Recipient to select whcih contacts will receive the Fail to Close Notification. Recipients will be displayed after being selected. Select Support Center from the drop-down menu. Click on Create New Ticket. Scroll to the bottom of menu and select Contact Support. What does Alarm in Memory mean? A trouble condition which advises that there was a previous alarm in the panel memory and has not yet cleared from the ADT Interactive servers. How do you resolve an Alarm in Memory trouble condition? This can only be resolved through the ADT Interactive Customer Portal. Select the Click Here to clear this message link on the Alarm In Memory issue display. What does Device Low Battery mean? A trouble condition which advises that a device is currently reporting a low battery status. How do you resolve Low Battery Conditions? Replace the battery of the device. Note: A low battery condition for devices that are also powered by AC mains power could indicate that AC power could no longer be functioning correctly. What does Geo-Service Device In Malfunction mean? This trouble condition indicates that a device has failed to check in for 24 hours. Launch the ADT Interactive Phone App With the device in malfunction. Flip Toggle Switch  to turn Geo-Services off. Scroll down and Click Log Out to log off ADT Interactive. Log in to ADT Interactive account through the Customer Web Portal. Click the link at the bottom of the FAQ to be re-directed to the ADT Interactive Customer Web Portal. If the malfunctioning device is listed under Geo-Devices – Select the device and remove it by clicking it’s delete icon. While staying logged into the Customer Web Portal – Log in to the ADT Interactive Phone App once again on the same device. Ensure the device is listed again under Geo-Devices. Select the Device to be edited. Click the checkbox to uncheck Report Malfunction if Device fails to check in for 24 hours. Note: Malfunction Reporting can only be disabled for Android Devices. What does Sensor Bypassed mean? A sensor is not actively monitored by the system due to it being in a not ready state upon arming. Disarm the system and re-arm it while all sensors are in a ready state. Note: Sensors are bypassed differently depending on what type of panel it is. Refer to the panel’s user manual for instructions how to bypass. What is a Sensor Malfunction? A Security Sensor that is having difficulty communicating with the alarm panel. How do you resolve a Sensor Malfunction? Re-locate the sensor closer to the alarm panel. Ensure the Panel and the sensor are not separated by metal. Rotate the sensor 90 degrees or move it to a different wall if it is a motion sensor. What does Sensor Tamper mean? A sensor is reporting a tamper condition. This could possibly mean that the tamper switch has been released. Ensure the tamper switch is secured for the device. Test your alarm system to make sure it is reporting correctly. Under User Information, enter the new user’s first and last name. Click +Add to add the user’s contact information. Click Access Control to setup which devices the user has access to. Enter the user’s new user code. You are unable to Create Users on the ADT Interactive app. To only remove access from an existing user, find the Access Icon  under Access Control and select which Access Point to remove. Video Motion Detection (VMD) – Trigger recordings based on any detected motion by the cameras. The camera identifies motion by measuring how the video’s pixels change from one moment to the next. There are no PIR motion detectors built into the camera. However, when VMD is set up correctly, it can be an effective way to capture activity and generate notifications for the customer. Select the video device to be edited from the Video Device dropdown menu. Draw a new VMD Window – Click and drag on the Live View image. Use the Sensitivity Drop-down Menu to select the motion sensitivity for the VMD Window. Note: A high sensitivity will allow more motion to be detected by the camera and more clips to be recorded. Use the Target Size dropdown menu to select the Motion Target Size. Note: Target size reflects the percentage of the VMD window that must detect motion for a clip to be recorded. A smaller target size will require less motion to trigger a recording, resulting in more recorded clips. You are unable to change Video Motion Detection settings on the ADT Interactive app. Video Device Name field – enter the new device name. You are unable to change a video device name on the ADT Interactive app.  Ensure Toggle Switch is on to turn on the Recording Schedule. Name the new recording schedule. Use the Select a Camera drop down menu to select which camera will record a clip when motion is detected. Use the Minimum delay between camera-triggered clip uploads dropdown menu to limit the number of clips recorded. Use the At home settings to not record when the system is Disarmed or Armed Stay. To choose Video Clip Recipients, click +Add Recipients. Click the entries in the Address book that are to be notified, or click the +New button to add a new Address Book contacts. Click the Camera Icon on the Image Sensor card. Click either the Peek-In Next Motion Icon or the Peek-In Now Icon next to the desired Image Sensor. The image will be uploaded to the gallery and sent to any Peek-In notification recipients. Click the ✏ Edit icon for Peek-Ins & Manual Image Uploads. Click the entries in the Address book that are to be notified, or click the +New button to add a new Address Book contact. To sort clips by camera, use the All Cameras dropdown menu.  Include unprotected clips icon.  Include event-triggered clips icon. To include deleted clips, click the  Include Deleted Clips Icon. To search clips by description, enter criteria in the Clip Description field. To only include clips from a certain timeframe, use the From: To: fields.